Ok, found out I have a later diff, and the axles come out with a puller rather than removing the cover and c-clips. I don’t have a puller, not enthused about buying a tool I might never use again, so maybe, just maybe, I can heat up the broken studs and tap them out. Bought some propane, (I’ll use it for painting as well, so if this does not work, it won’t be wasted). I’m slightly nervous about flame in my shade structure, as it is built with wood and tarps. So a bucket of water, aluminum foil on the ground and then heat up the stud. Heat it up some more. Give it some slightly harder taps. I shouldn’t get it too hot as it might cook the seal and then leak on the brakes, and I shouldn’t hit it too hard because it will ruin the bearing. Well, heating it up did not work. But the puller won’t work very well because it is designed to attach to the (missing) studs. Ok, play on the Internet for a while. Come across a video where the brake drum is flipped, and then put back on the axle. Then three of the nuts are put back on loosely so the drum can slide back and forth on the studs. Grab the drum, and yank hard on it, basically using the drum as the puller. 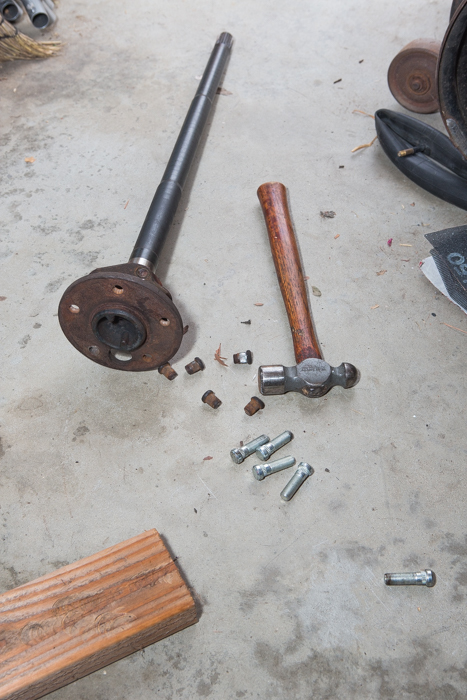 It took the internet person about 10 good yanks for the axle to come out. I can’t put the drum back on (damn you broken studs! ), but there is the backing plate for the brakes. It’s between the axle and the diff. 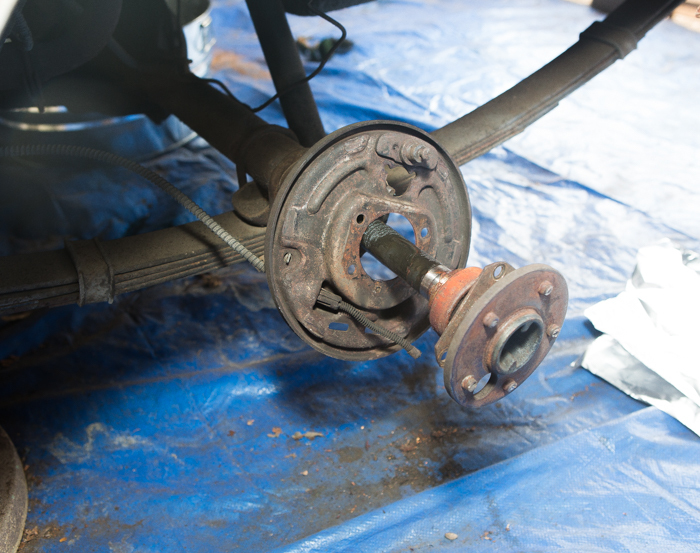 Ok, the backing plate does not have as much weight (ie.. momentum) but after 15-20 good yanks the axle comes free. Look at that rust on the bearing! Now, how hard are the broken studs to get out? Put a piece of wood on the ground, grab my smaller hammer, and give the first one a hit. And it moves on the first hit! Ask Jenna to hold the axle while I smack them out, 3-4 hits each. And the car came with 5 brand new wheel studs, ready to install. 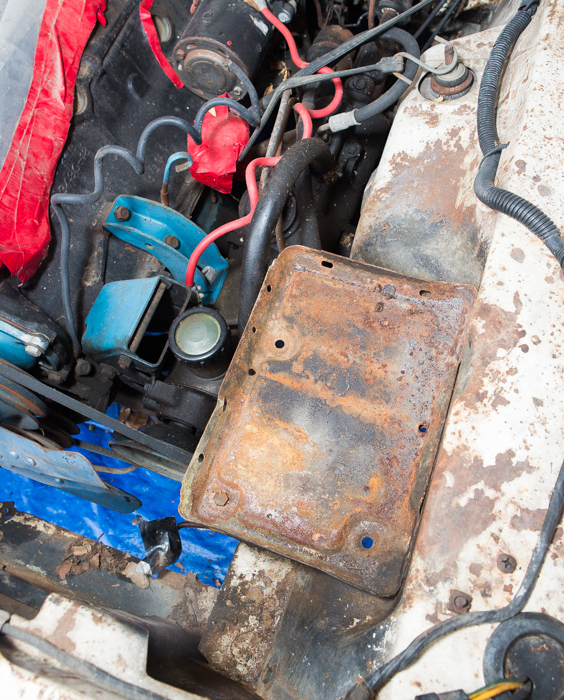 Remove radiator (transmission cooler lines come off easily). Three of the four bolts holding the radiator are good, the fourth will need a new speed nut and bolt. 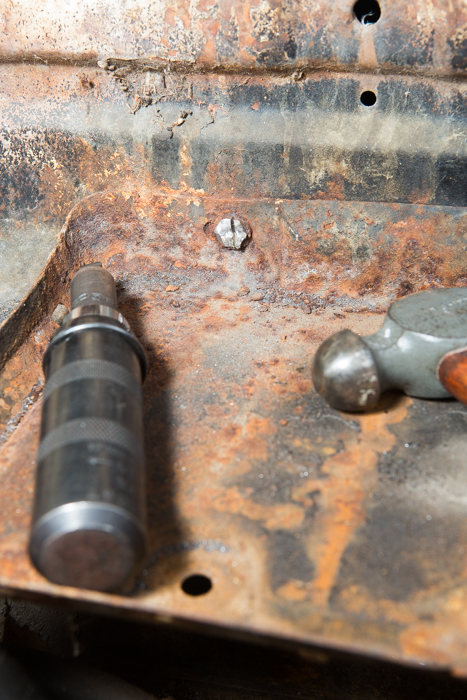 The battery tray is RUSTY. Four of the six bolts came out with some WD40 and some love. The fifth and the sixth not so much. The fifth nut fit a 12mm socket. So I put a socket on it and hit it with my Whacking Thingy ™ and after finding a way to hold it, I whacked away and it finally came off. The sixth was really fucked up. Use my Dremel cut-off wheel to cut a groove in the head, exactly like it was made to fit a flat head screwdriver. Put the screwdriver bit on my Whacking Thingy ™ and after 10 or so whacks it started to move, then the head fell apart and I SLOWLY undid it with my Vice-Grips. Battery tray with seized nut. Seized nut has groove cut into it, and is patiently waiting for my Whacking Thingy (TM) to knock some sense into it. Whacking Thingy ™: Officially called an ‘Impact Screwdriver’ buy one, it just might save your soul. Remove power steering pump. One of the hoses was so brittle it broke off when I moved it. No fluid in the pump. But the bolts came off easily!